“I’m hoping that I’m just starting in my prime. I’ve already been working out with [Garrett Giemont], our strength coach, already. I’ve never worked out this early. It’s not like high-intensity, out killing myself, but I’m working out, I want to come to camp lighter than I’ve ever come, in better shape, because as you get to a certain point, a certain age in this football thing, your body doesn’t recover like it used to.” –Ben. Ben Roethlisberger already has adjusted his game, and it has nothing to do with old or new coordinators, old or new offenses, things Art Rooney did or did not say. It has plenty to do with his 30th birthday March 2. “That’s why I’m working out already,” Roethlisberger said. He began training at the Steelers facility on the South Side last week, days after he returned from an extended Pro Bowl stay in Hawaii. He talked to coach Mike Tomlin about where he is in his career and about the future. “When I talked to Mike, I said I don’t know how much longer I have to play, no one does; it could be two years, three years, it could be eight years. 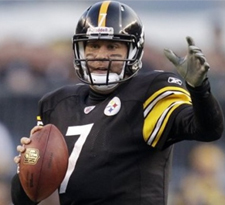 Who knows?” Roethlisberger said during an extensive interview Thursday. Two of the Steelers’ highest-paid players are apparently willing to help the team with the salary cap. The agents for quarterback Ben Roethlisberger and outside linebacker James Harrison said their clients are agreeable to restructuring their contracts before the start of the NFL’s new year. Teams have to be under the 2012 salary cap by 4 p.m. March 13. Ben was a guest on WDVE’s Morning Show with Mike Prisuta. 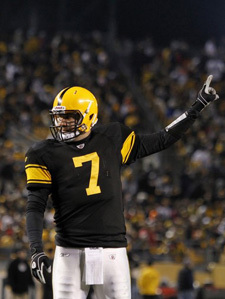 He talked about his meeting with Mr. Rooney, his new offensive coach Todd Haley, and the state of the Steelers offense. You can listen to the podcast of the highlights of his interview here. You can keep up with Mr. Prisuta on Twitter (and read some of Ben’s quotes) here.